Тhe WINBIX marketplace aims to create a new channel for sales, allowing participants to sell goods at the demand prices at any time. The system uses the reversed auction model. The price of the goods decreases until one of the participants stops the auction. The first buyer who stops the auction wins. The specific features of the auctioning process are intellectual property of the project: an application has been submitted to USPTO. Distinctive features of the WINBIX marketplace: - minimum price per each lot is determined randomly subject to the minimum price corridor established by the Seller, i. e. the minimum price per each lot is different and the value thereof remains unknown to the Buyer - price reduction increment is determined randomly, in the range of the previous price and stop price; thus, each subsequent price value remains unknown to the Buyer - stock balance is unavailable to the Buyer, each lot (item) may be the last one - Buyer can set any price value at which the System should notify the Buyer. This information is available to the Seller and provides an opportunity to forecast demand at different price levels - the time interval for the price reduction is set by the Seller for every item - there is an established direct correlation between the Seller’s sale costs and the quality of provided services - settlement of disputes by arbitration involving Sellers, Buyers and the System; - opportunity to create quotations for Sellers and, if approved, to purchase products at the desired price The main income of the company will be a commission for providing intermediary services for the sale of products by auctions on the e-trading platform winbix.com. Further, the Company plans to monetize the Buyers’ interest in each price reduction event through advertising. An increased number of product views are expected before purchase, as compared to traditional online stores, enabling the advertisers to increase the number of contacts with a “hot” target audience. Russia is the Project region now; within 2 years, it will be China, the European Union, and the US. The target Project audience shall include: - Sellers – small and medium intermediaries/manufacturers who cannot afford to bear the costs of organizing and maintaining online sales. Further, the marketplace will be useful for companies wishing to occupy a niche among customers with a limited income level (the target audience of bulletin boards, joint purchases); - Buyers – people with average and below average income having to combine an acceptable consumption level and limited financial resources. The audience ready for time-consuming costs in exchange for the option of obtaining a satisfactory price offer. The team started developing the MVP in July 2018 at its own expense. For this moment MVP is ready. The project emits ERC-20 investment tokens called WINBIX (WBX). WBX tokens are put into circulation through the DAICO procedure (smart contract-controlled use of the project's funds) in order to protect participants. Distinctive features of the PreDAICO/DAICO WINBIX: - the collected funds are stored in a smart contract and allocated to the team in parts. Only Ethereum is accepted as payment for tokens. Ethereum is stored in a smart contract. The allocation of funds occurs once a month in the amount of TAP. The team may initiate a change of TAP no more than 1 time in 30 days. For this decision to be made, the consent of 50% of the voters plus 1 vote is necessary. Only tokens of buyers at the DAICO/PreDAICO can participate in the voting. Tokens which are allocated through marketing programs (Airdrop, Bounty) or purchased on the secondary market do not have the right to vote. 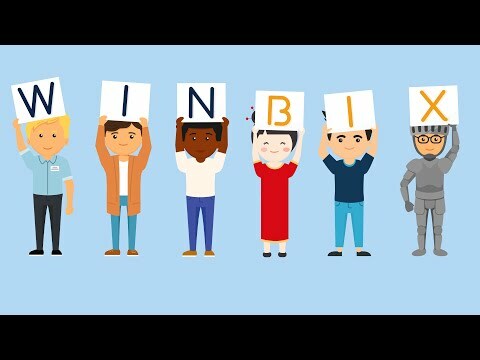 - reporting of the team to the investors The team publishes reports on the use of funds on the official website of the company: winbix.com - giving investors the right of sole exit from the project Any token (except the tokens which are received through marketing programs or purchased on the secondary market) can be returned to the PreDAICO/DAICO smart contract (after 45 days since the end of the PreDAICO or after 90 days since the end of the DAICO) with the receipt of a share of the balance of funds for the moment. - the tokens are not allocated to the project team and the advisers. - creation of a smart contract to back by a token WBX (unit of backing is Ethereum) A smart contract “SECURITY” is created to be funded by the part of the marketplace commission fee 5 years. Any token (without any limitations) can be returned to the contract with the receipt of a share of funds for the moment. - a reversed buyback (BUYBACK) at the fixed price in Ethereum through appropriate smart contract Within 6 years from the launch of the marketplace, WINBIX makes a reversed buyback of tokens at the fixed price. The purchase price is increased by 100% annually. The System operation is based on the Dutch Auction principle, i. e. constant reduction in the product price until the products are sold or until the stop price level is achieved. Minimum price per each lot is determined randomly subject to the minimum price corridor established by the Seller, i. e. the minimum price per each lot is different and the value thereof remains unknown to the Buyer. Price reduction increment is determined randomly, in the range of previous price and stop price; thus, each subsequent price value remains unknown to the Buyer. Stock balance is unavailable to the Buyer, each lot (item) may be the last one. Buyer can set any price value at which the System should notify the Buyer. This information is available to the Seller and provides an opportunity to forecast demand at different price levels. There is an established direct correlation between the Seller’s sale costs and the quality of provided services. Opportunity to create quotations for Sellers and, if approved, to purchase products at the desired price. Settlement of disputes by arbitration involving Sellers, Buyers and the System. DAICO performance enabling the investor’s maximum protection. Buyback and destruction of tokens at fixed prices through the BUYBACK smart contract. Issue of personal WBX tokens (ERC-20). Creating and financing the SECURITY smart contract (Ethereum security unit). Idea of holding the auction. Working over the auction algorithm. Development and testing of the System site, trading platform, payment System and other WINBIX System components. Marketing research and selection of suppliers. Getting prepared to PreDAICO activities. Trading platform follow-up, selection of Sellers. Marketplace launch in Southeast Asian countries. Commencement of activities in the US and EU.